According to one report, Skyworth will use LG Display's WRGB panels. The second report actually says Skyworth are releasing a "Samsung OLED TV", but they still say it is an WRGB panel so this may be just a mistake. 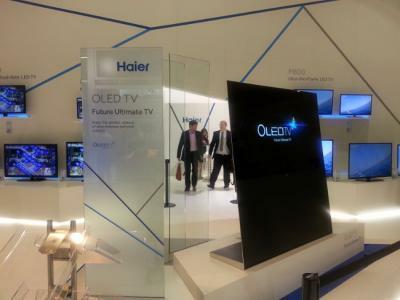 This second report also claims that Haier already released their first OLED TV in China. Perhaps they refer to Haier's 55' OLED TV prototype shown in IFA 2013 earlier this year. There were reports from Korea that say that Haier (and Seiki as well) actually obtained those panels without permission from Korean makers - they simply bought OLED TVs in the open market, took them apart and then reassembled the OLED panels themselves into their own designs. Did Haier and Seiki use Korean OLED panels without permission in their OLED prototypes shown last month? Haier shows a 22" transparent OLED panel?